Architrave built into wall, Damdama, Hazaribagh District. bl.uk > Online Gallery Home	> Online exhibitions	> Asia, Pacific and Africa Collections	> Architrave built into wall, Damdama, Hazaribagh District. 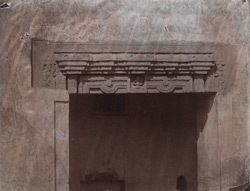 This photograph of an architrave above a doorway or window in the temple at Damdama, Hazaribagh District was taken by Joseph David Beglar in the 1870s and forms part of the Archaeological Survey of India Collections (Indian Museum Series). Damdama is located in the modern state of Jharkand. The site is made up of a number of mounds in which were found large eighteen inch bricks, indicating antiquity, and a number of temples, one of which is pictured here.